Foodista | Recipes, Cooking Tips, and Food News | You’ll Flip for These Skinny Frozen S’mores, No Campfire Needed! Break one graham cracker in half. Spread one half with 1 tablespoon marshmallow cream and sprinkle with 1 teaspoon mini chocolate chips on top of the cream. Top the other half with 2 tablespoons frozen yogurt and place marshmallow side in, on top of the yogurt, to create a sandwich. Using a dull knife, wipe the sides clean. By hand, place a few chips on each side. Place on a plate and freezer. Freeze until firm before serving. If making several at once, keep frozen yogurt in the freezer and follow step 1 with as many as you desire to make. Next, follow step 2 and step 3. When frozen, wrap each sandwich in plastic wrap and store in freezer. They’ll keep in the freezer for several weeks, if they last that long! Most supermarkets sell Honey Maid’s low fat graham crackers. They’re displayed in the cookie aisle. Kraft sell marshmallow cream in (7 oz) jars called Jet-Puffed marshmallow cream. You’ll find it in the same section as bagged marshmallows but you might have to ask your grocery. Buy the fat-free frozen vanilla yogurt at your local shop or a store bought brand such as Dryer’s fat free vanilla frozen yogurt. Breyer’s Vanilla Bean Light ice cream also works great for this recipe. To ensure that you make a clean break in each graham cracker be sure to break in half with the right side up on each cracker. If you break with the back side up it doesn’t create a clean cut down the middle. If using soft frozen yogurt from your local shop, freeze for at least an hour to become firm and easier to work with. 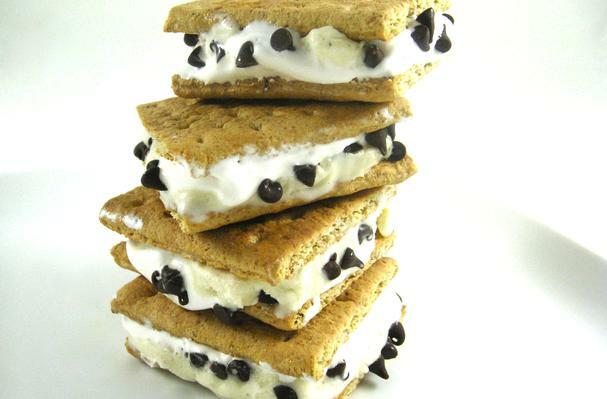 If you love campfire s’mores, you’ll really love these luscious low fat frozen treats. We’ve taken all the yummy flavors of a classic s’more to create a skinny ice cream sandwich. This recipe serves one, so it’s easy to assemble, but make a bunch and keep them on hand in the freezer. One skinny sandwich has 150 calories and 3 grams of fat compared to a Blue Bunny S’mores Ice Cream Bar at 170 calories and 12 grams fat. This decadent frozen treat makes a terrific dessert for a summer barbecue or celebration. One bite and we know you’ll want to keep some in the freezer to enjoy anytime!